I was very impressed by the quality of his ideas and presentation, debunking the climate science that is being taken as gospel by the administration, and the resulting need to "do something!" to fix it. His arguments are carefully structured, accessible to the scientific layman, and he weaves in historically analogous situations to support his points. I can't recommend it highly enough (though I wish he would have stopped before writing the last two paragraphs.) As an anecdote unequivocally proving the potency of the speech--you only need one data point for proof, right?--I sent it to a friend, who sent it to his girlfriend, who sent it to her father, a retired oceanographer, and he is now afire with new ideas questioning all sorts of old notions. Here are a few choice quotes, but they don't do the speech justice. I recommend downloading the PDF from this site and printing it out. You'll want a pen handy to underline key points. It's that good. Al Gore likes to display graphs of temperature and CO2 concentrations over the past million years or so, showing that when CO2 rises, the temperature also rises. Doesn’t this prove that the temperature is driven by CO2? Absolutely not! If you look carefully at these records, you find that first the temperature goes up, and then the CO2 concentration of the atmosphere goes up. There is a delay between a temperature increase and a CO2 increase of about 800 years. This casts serious doubt on CO2 as a climate driver because of the fundamental concept of causality. A cause must precede its effect. For example, I hear my furnace go on in the morning about six o’clock, and by about 7 o’clock, I notice that my house is now so warm that I have too many covers on my bed. It is time to get up. It would never occur to me to assume that the furnace started burning gas at 6 o’clock because the house got warm at 7 o’clock. I keep hearing about the “pollutant CO2,” or about “poisoning the atmosphere” with CO2, or about minimizing our “carbon footprint.” This brings to mind another Orwellian pronouncement that is worth pondering: “But if thought corrupts language, language can also corrupt thought.” CO2 is not a pollutant and it is not a poison and we should not corrupt the English language by depriving “pollutant” and “poison” of their original meaning. I remember being forced to read Voltaire’s novel, Candide, when I was young. You recall that Dr. Pangloss repeatedly assured young Candide that he was living in “the best of all possible worlds,” presumably also with the best of all CO2 concentrations. That we are (or were) living at the best of all CO2 concentrations seems to be a tacit assumption of the IPCC executive summaries for policy makers. But one of my favorite parts comes early in the speech where he talks of the futility of past efforts to to change the climate by wishing. 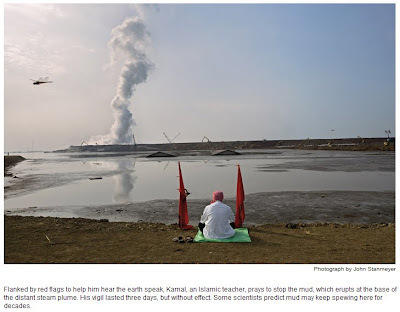 This man is praying to stop mud, just like the Bishop prayed to stop the glacier, and the Aztecs sacrificed thousands to their gods. Now the environmentalists and their friends in power are looking to march the economy, and therefore all of us, up to the top of the temple to sacrifice us to their climate god via Cap and Trade. Rather than appealing directly to faith, these last claim to fly the flag of science, all the while persecuting those who disagree with their hysterical claims as if this were an auto da fe. If you're at all interested in this issue and would like some good points to bring up when you hear the typical "Denier!" assertions, or if you know someone on the fence who might be just active minded enough to listen to reason, you'll want to read this testimony and pass it on. It's funny you should mention this. I came across this story last week about Roman Catholics seeking permission from the Pope to pray their glacier stops shrinking. Pay especial attention to the "water is life" clap-trap. Unsettling stuff. What disgusts me about Objectivists is their reflexive, malign and hypocritical dishonesty, especially when it comes to the subject of religion. I must admit that your lumpen cultural ignorance and philistinism comes a close second, though. JSabotta, that was a pitifully useless comment. There is simply nothing to say to these arbitrary insults and assertions. The only requirement for comments on my blog is to keep things mostly civil, and to rely on actual facts and ideas, and you failed. But because it raises an interesting point for clarification, I'll address what you said in your first paragraph. Perhaps you were objecting to an idea you assumed I was asserting, that of moral equivalency to the two actions -- a Bishop praying and an Aztec human sacrifice. If so, your assumption was wrong. Murder, whether in the name of religion or otherwise, is clearly wrong, whereas praying does not imply force of any kind. While it represents a moral failing of the individual to live by reason, it's not in the same ballpark as killing. If you had actually read my post more carefully, you would have seen that Happer himself brought up the Aztec example, showing how absurd it is to try and control reality by acting on faith (a brutal, vicious faith that required human sacrifice, but faith nonetheless). He compared it to the absurdity of praying to stop a glacier, and I added the absurdity of praying to stop mud. This is a metaphysical and epistemological, rather than ethical, argument. Faith is not a valid means of knowledge, and one's consciousness does not control existence. The absurdity of all three examples in my post demonstrates that clearly. Next time, before dumping your emotionalistic rubbish into a comment, try reading carefully, and if you're still not clear or would like to disagree, put forth an argument supported by evidence.